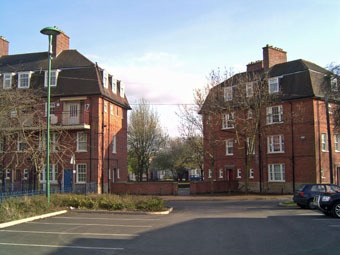 This pic shows the Penn Avenue flats in Old Lenton. They were built in 1926 by Jesse Boot for his own employees and local residents whose homes were demolished to make way for Abbey Bridge* road (which cuts across the bottom right-hand corner of the. In fact, the rent was so high at the time (15/-) that few of his own employees or the those who lost their homes actually moved in, so they were let to local people in general and eventually became part of Nottingham City Council's housing stock. The curving road behind is Church Street. Enlarged you can clearly see the Lenton war memorial and Albert Ball VC Memorial Homes. Then in the centre above the flats is Holy Trinity Church, Lenton's parish church. To the left of the church is Lenton Recreation Ground, much more open than it is today. An aerial photograph taken today would look very different! 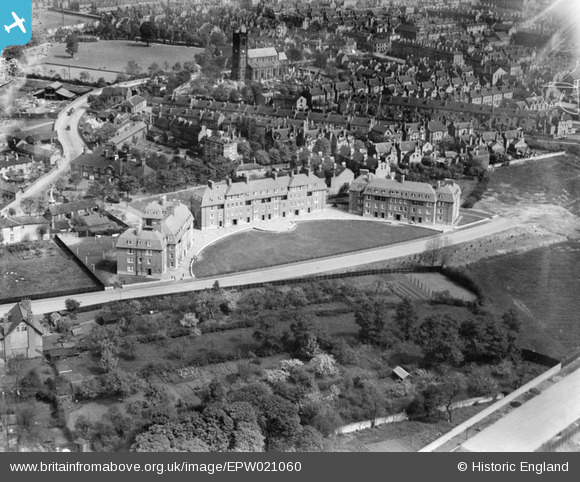 NOTE: * Abbey Bridge was built by Jesse Boot to provide a direct link between Nottingham city centre and the new University College (see other aerial photographs), via Castle Boulevard to the east and University Boulevard to the west.